Two Feet & a Heartbeat Walking Tours has been added to your itinerary. Kids will appreciate attractions like Caversham Wildlife Park and Adventure World Perth Australia. Explore the numerous day-trip ideas around Perth: Penguin Island (in Rockingham), Dolphin & Whale Watching (in Mandurah) and Fremantle (Fremantle Prison & Fremantle Markets). Dedicate the 23rd (Thu) to wine at some of the top wineries in the area. On the 25th (Sat), give your taste buds a day to remember with a local gastronomic tour. 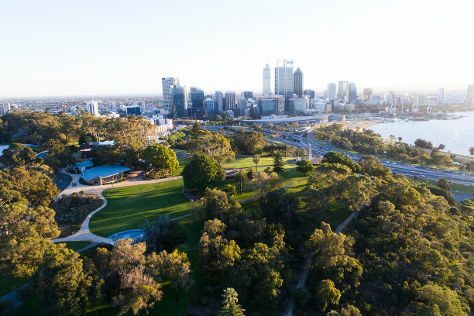 There's much more to do: admire the natural beauty at Kings Park & Botanic Garden, get your game on at Elizabeth Quay Carousel, pause for some photo ops at The Bell Tower, and contemplate the waterfront views at Swan River. For photos, reviews, more things to do, and tourist information, refer to the Perth online trip builder . If you are flying in from Singapore, the closest major airport is Perth International Airport. In May, daily temperatures in Perth can reach 25°C, while at night they dip to 11°C. Finish up your sightseeing early on the 25th (Sat) so you can travel back home.